I’m sure you have all been to the market and seen those bags of russet potatoes where its like $1.50/lb, or you can buy a 5lb bag for $4 or a 10lb bag for $5. So obviously wanting the most bang for my buck, I always opt for the 10lbs, and to this day I don’t think I have ever finished all 10lbs before they went bad. I’m Asian so most of my carbs come in the rice and noodle format, not so much the potato. But since I bought a 10lb bag, what the heck, I’ll make some more potatoes. This time I tried scalloped potatoes due to Jenn’s extreme, otherworldly, not quite sure how that happened love of cheese. I followed this recipe and it turned out pretty well. 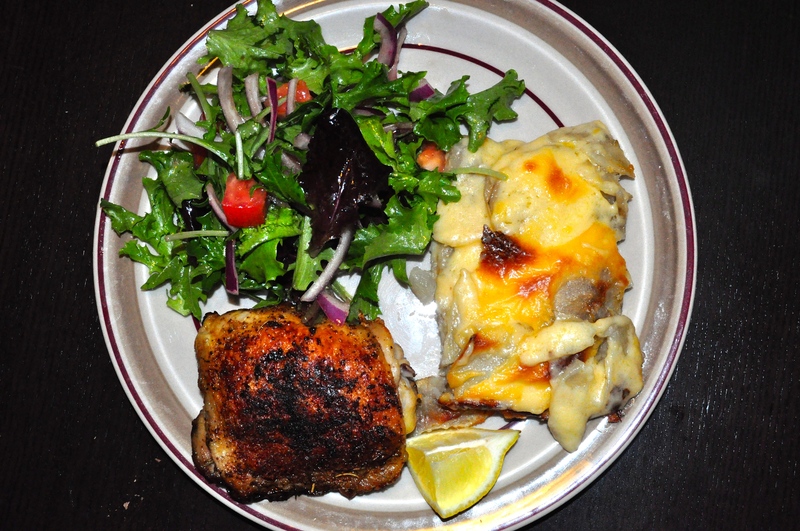 The scalloped potatoes were obviously (not so obviously) a side dish to a pan fried chicken I made. I seasoned bone-in, skin-on chicken thighs with a mix of seasoned salt, black pepper, thyme, rosemary, garlic powder and onion powder. It was a mix that I got as a gift for attending my cousin’s wedding since they also like to cook. After seasoning them, I pan fried them in some butter. I like the skin-on thighs because I like the crispyness of the skin when I fry them. So those two and a side salad completed the meal. It was definitely on the heavier side, but it was delicious. Oh my goodness! Scalloped potatoes are one of my most favorite side dishes! I am going to have to try this! It’s hard to find your blog in google. I found it on 21 spot, you should build quality backlinks , it will help you to get more visitors. Just a couple of wannabe foodies.